Organ meats, eyeballs, tongues… these are things people in the US won’t often CHOOSE to eat or even think of including in their menu. But, Anthony Bourdain was different. He had a mentality that inspired a generation and pushed them into the “unknown”. He once said, “If I’m an advocate for anything, it’s to move. As far as you can, as much as you can. Across the ocean, or simply across the river. Walk in someone else’s shoes or at least eat their food.” These words by the internationally famous and loved Anthony Bourdain, outline his personality and his passion, his zest for a life of truth, beauty, and diversity. And the spreading of this knowledge of diversity could have been perhaps his greatest gift to the world. Sadly, Bourdain was found unresponsive in his hotel room and died on June 8, 2018. It was a while he was filming an episode of his CNN TV show, “Parts Unknown” in a small village in France. The death was ruled a suicide by hanging, and a confusing one at that since Bourdain seemingly had an amazing life; reported by deadorkicking.com. Despite his former issue with drugs, there were no narcotics in his system, according to a toxicology report. They had him cremated in France, but his remains were sent to his remaining family members. Anthony Bourdain had created a kind of larger-than-life aura while alive. He got a reputation as a kind of a rough around the edges, worldly chef who wanted to have a great time but wasn’t going to take any crap from anybody. This vibe that he created could be from his upbringing and experience growing up in a restaurant environment. Bourdain was born in New Jersey, and he started out his kitchen career as a dishwasher in his teenage years. According to interviews, he loved it! And, he felt that he learned a lot of good lessons by being a simple dishwasher. At this time of his life, he fell into drugs and developed a heroin addiction. This issue caused problems in his later life. He smoked cigarettes and drank, often known to drink quite heavily. Later, Bourdain started off at a college when the time came, but he eventually dropped out in order to go to culinary school. He worked in all parts of the kitchen and worked his way up through the ranks until he became the executive chef at a well-known Manhattan restaurant called Brasserie Les Halles. He had the chance to work with all manner of French dishes and was deeply appreciative of the clientele: “Recently, my career has taken an eerily appropriate turn: these days, I’m the chef de cuisine of a much loved, old-school French brasserie/bistro where the customers eat their meat rare, vegetarians are scarce, and every part of the animal—hooves, snout, cheeks, skin, and organs—is avidly and appreciatively prepared and consumed.” These folks weren’t shy of tasting something a little unique to the American palate, and that willingness to try something inspired Bourdain’s work. 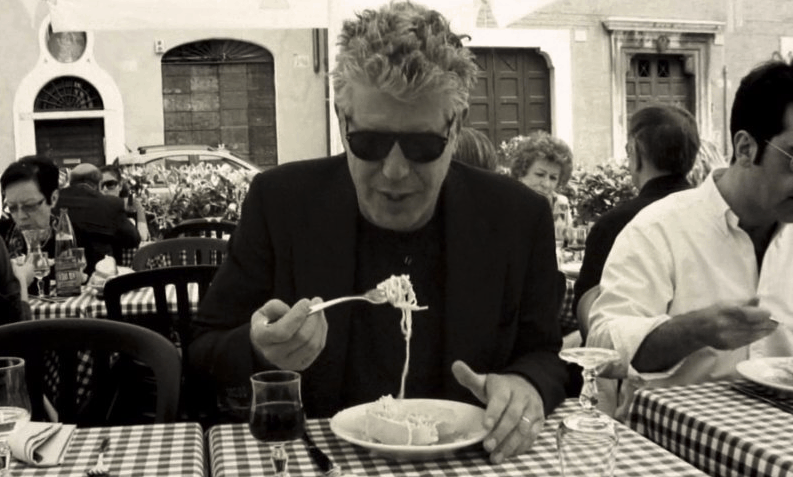 Bourdain had an attitude to food that Americans don’t tend to have, and seem to be more of an attitude of the European. Enjoy, enjoy, enjoy! When you savor, you want to eat good and adventurous things, not just a load of crap? He wanted to push the limit with food as well. Yes, of course, enjoy your food, but also step outside of your comfort zone and actually try something new! Even if it’s a goat’s head swinging in a crowded marketplace. The thing is: It could be the best thing you’ve ever eaten. But, you’ll never know unless you TRY. He is always remembered for the award-winning TV shows, which couldn’t seem to stop earning awards, but many forget that his initial fame came from his writing. He, of course, was first and foremost a chef, but he wanted to step into the writing world. He first gained his international acclaim with an article he sent to the New Yorker. It was called “Don’t Eat Before You Read This”, and it’s famous message, “Don’t order fish on Mondays”, and the idea that the world could do without these vegans and vegetarians. But, the article also described a person who loved the camaraderie, and all levels of a working kitchen. He appreciated each cog in the machine and you can feel the love his has for that world. He also wrote two suspense novels before this as well as other works related to his cooking. After this famous article, he went on to write Kitchen Confidential: Adventures in the Culinary Underbelly in 2000. It quickly turned into a best-seller, and Bourdain’s fame was born. His writing is quick, descriptive, fascinating, cringe-worthy. It makes you laugh, and it makes you think and actually feel something. Besides food, writing was another of his true passions, and it often gets overlooked alongside his stellar success in the TV industry. “A Cook’s tour”, and then “Anthony Bourdain: No Reservations”, for which the show received 2 Emmys. And, then starting in 2013, CNN had the idea to start “Parts Unknown” which was a 5 year long program, resulting in 5 Emmys. Let it never be said that Bourdain wasn’t successful. “Parts Unknown” had Bourdain traveling from city to city in search of something new, something adventurous, and something memorable to share with the audience. It was a new kind of show that helped to add diversity to the screen. People who never traveled or were afraid of “different” things, were suddenly transported to new worlds and new ventures, perhaps even getting a taste of something they never knew before: culture. People were drawn to his charisma, the way he looked at the kitchen, food, and the way he looked at life. He was consistently reported as down-to-earth, funny, charming, and unfailingly honest. In Vietnam, Barack Obama shared a meal with him, and after his death, made a comment on Twitter about how Bourdain taught us about food’s ability “to make us a little less afraid of the unknown”. We all know the world could use a little bit more understanding, and Anthony Bourdain was part of the bridge to make that happen. Enjoy the fearless and step into the darkness in order to appreciate the light. And then perhaps, if we all step into one another’s shoes, and eat each other’s food, we may get just a little bit more understanding of one another. Connecting cultures, showcasing diversity, bringing the world to a person’s living room that was what people took away from his work on TV. He may have started a trend of cultural understanding that literally opened up the world. So, why would such a man with so much to live for and having accomplished so many wonderful things, commit suicide? We don’t know. He left behind his mother, a brother, a daughter, a loving girlfriend (Italian actress Asia Argento), friends, and of course a huge following. Get out and move. Move! Change yourself, do something unique and you will find the beauty in life. Even though we are sad that he has chosen to leave this life behind, what a gift he has been to his audience and perhaps the future of cultural understanding. Goat’s head, anyone?